Here are a few highlights from the past several months of activities at and about the Doel Reed Center for the Arts. The Reed Center joined the Philbrook Museum of Art in Tulsa to co-host a Doel Reed exhibition at Philbrook Downtown from September 2015 to March 2016. "Interludes" included more than 20 paintings, drawings and prints. The Property Endowment Fund recently received a total of $83,000 in gifts, with half coming from a donor who accepted a good-natured challenge from Maggie Barrett. At last September's event celebrating the completion of renovation work, Barrett spoke about the cost of maintaining the facilities and said a donor had agreed to match every dollar raised for the fund at that time. We want to thank all of the donors for their generosity. We also want to extend a special thanks to Nigel Jones, OSU architect, for the recent gift in honor of his parents, Robin and Ann Jones of Wrexham, Wales, U.K. As a sign of appreciation, the portal on Casa Cooper is now named The Jones Portal. The center's collection of Doel Reed works has been moved to Stillwater, including recent gifts to that collection. If you have a piece you would like to donate, please contact Carol Moder or Deb Engle. The Doel Reed Center for the Arts hosted two academic courses from May 16-27, including the largest class it has ever had. Eighteen students participated in "Biomimicry: Using the Principles of Nature for Design Inspiration," taught by Cosette Armstrong from the Department of Design, Housing and Merchandising. The course was originally capped at 15 students, but the overwhelming demand led to increasing the number of seats. The other class was "New Mexico Regionalism & Modernism," taught by Edward Walkiewicz. From July 11-23, the center hosted two more courses. "The Science of Art" was taught by Smith Holt, professor emeritus of chemistry at OSU and visiting professor at Colorado College, and Cristina González, associate professor of art history at OSU. "Notebooks & Nature: Writing Our Way to a Water Ethic" was led by Rebecca Damron, associate professor of English and director of the OSU Writing Center. The leisure learning courses ran from July 25-29. 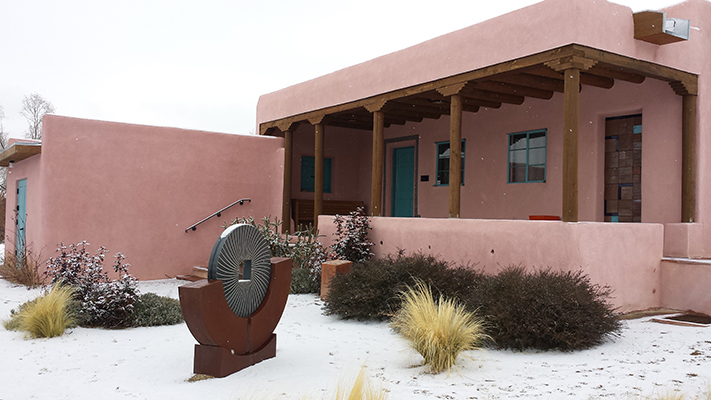 Taos master printmaker Jennifer Lynch taught a "Solarplate Printmaking Workshop." Taos native Marc Harrell led "Beginning Fly Fishing." "New Mexico Farm to Table" was taught by Barbara Forsberg, owner of the Taos-based Brett House Catering. Finally, Marcella Sirhandi, OSU professor emerita of art history, taught "Historic Taos Churches: Form Follows Function: Style, History, Religious Ritual and Tradition."